A variety of arthropod pests attack strawberries in California and farmers primarily use chemical pesticides for pest management (CDPR, 2014 and Zalom et al. 2014). Recent field studies demonstrated the potential of entomopathogenic fungi, Beauveria bassiana and Metarhizium brunneum in managing important pests such as western tarnished bug, Lygus hesperus in strawberries (Dara 2013a;2014;2015). Entomopathogenic fungi are commonly used as biopesticides where fungal spores cause infections when they come in contact with the target pests. However, these fungi are also reported to endophytically colonize plants (Dara et al., 2013; Behie et al., 2015). Endophytic colonization of B. bassiana in various host plants and the impact on herbivore populations was previously described in some studies (Akello, 2008, Bing and Lewis, 1991, Posada et al., 2007, Tefera and Vidal, 2009, Wagner and Lewis, 2000). An earlier study showed that B. bassiana endophytically colonized strawberry roots, petioles, leaf lamina, pedicels, sepals, and calyxes and persisted up to 9 weeks through soil inoculation (Dara et al., 2013), but its impact on herbivore infestations, especially those with piercing and sucking mouthparts is unknown. A greenhouse study was conducted using green peach aphid, Myzus persicae Sulzer, a minor pest of strawberries, as a model insect to evaluate the impact of endophytic B. bassiana. The study was conducted in a greenhouse using the following treatments: i) untreated control, ii) six weekly soil applications of B. bassiana starting from one week after planting, iii) four weekly foliar applications of B. bassiana starting two weeks after planting, and iv) both soil and foliar applications at respective intervals used with individual applications. 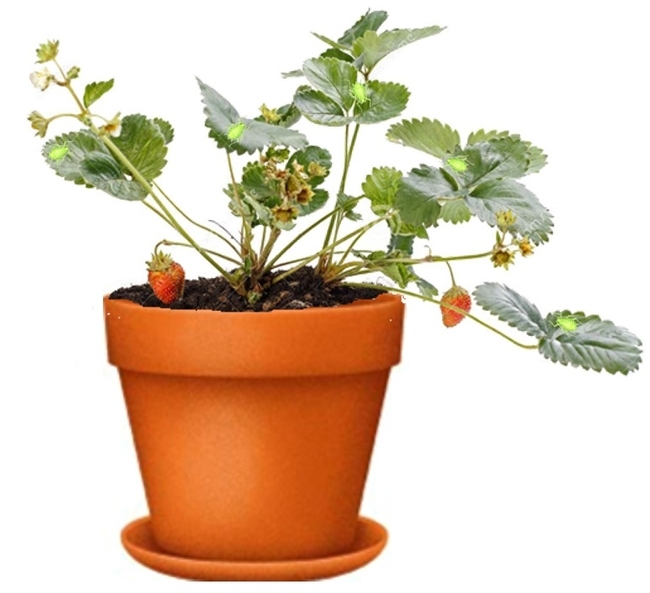 Each treatment had four strawberry transplants, obtained from a commercial source and planted in 1 gallon pots (18 cm diameter and 18 cm height) with potting medium composed of a mixture of steam sterilized field soil and perlite. Five grams of Osmocote(R) Slow Release Fertilizer 14-14-14 (Carolina Biological Supply Company, Burlington, NC) was added to each pot followed by watering to the point of saturation. One week after planting, each strawberry plant was infested with 10 pre-adult M. persicae obtained from a greenhouse colony. For soil treatment of B. bassiana, 1 ml of Mycotrol-O in 100 ml of water was placed around the base of the plant a week after planting and one week prior to aphid infestation. For foliar treatment, 0.25 ml of Mycotrol-O in 100 ml water was sprayed, starting one week after aphid infestation, using a plastic spray bottle until the foliage was thoroughly covered. A polystyrene plate with a hole in the center and a slit across the radius was placed around the base of each plant before administering treatments to avoid cross contamination of soil and foliar treatments. The hole around the plant base was plugged with a ball of cotton. The number of live and dead aphids, fully expanded leaves, and flower shoots were monitored weekly for a total of seven weeks after artificial infestation and the means for the observation period were calculated. Data were analyzed using ANOVA and significant means were separated using Fisher's Least Significant Difference test. 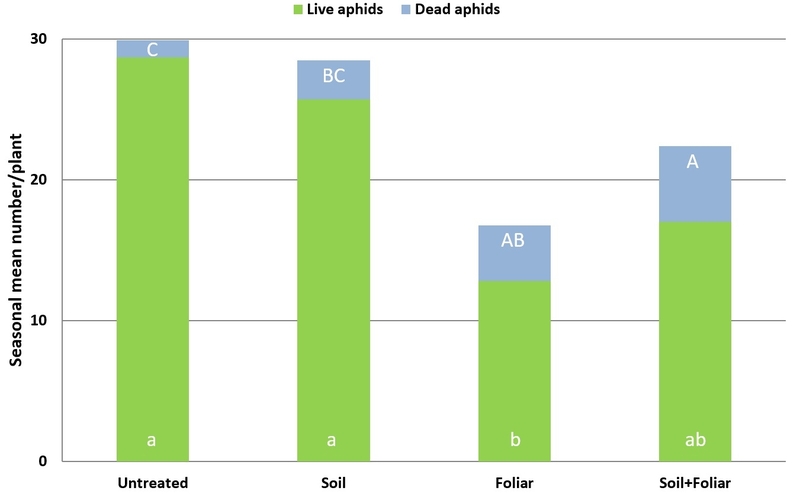 Proportion of live and dead aphids was analyzed after arcsine transformation. Since endophytic colonization of strawberry by B. bassiana was previously reported (Dara et al, 2014), plant tissue was not tested again for the presence of fungus. During the experimental period, average minimum and maximum temperatures were 15.6 and 26.7oC and relative humidity values were 51 and 93%, respectively. Results indicated that B. bassiana contributed to the mortality of M. persicae through both endophytic and pathogenic modes of action. A significantly higher number of dead aphids was seen on treated plants compared to untreated plants (P = 0.0002). The combination of soil and foliar applications had an additive effect with significantly higher number of dead aphids than soil or foliar applications alone. There was no significant difference in the number (P = 0.0078) or proportion (P = 0.0001) of live aphids or the number of adult aphids (P = 0.0089) between untreated plants and those treated with soil application of B. bassiana. However, there were significantly fewer live aphids where B. bassiana was applied as a foliar spray and a combination of soil application and foliar spray. The impact of treatments on live nymphs was more pronounced with a wider range of significant differences than on live adults. The number of fully expanded leaves and flowering shoots was similar among the treatments (P > 0.05) during the observation period. Although entomopathogenic fungi are known to have endophytic interactions with various plant species, how this interaction influences herbivore populations is not fully understood. Several studies shed some light on this new area of research, but they primarily include insects with chewing mouthparts such as the banana weevil, Cosmopolites sorditus on banana (Akello et al., 2008), the corn ear worm, Helicoverpa zea on tomato (Powell et al., 2009), and the European corn borer, Ostrinia nubilalis on corn (Bing and Lewis, 1991, Lewis et al., 1996) except for a recent report of endophytic B. bassiana and Purpureocilium licacinum impacting the survival and reproduction of cotton aphid, Aphis gossypii Glover on cotton (Castillo Lopez et al., 2014). Antibiosis is thought to be one of the mechanisms for the endophytic entomopathogens to affect herbivores (Castillo Lopez et al., 204, Vega et al., 2008). The current study clearly indicated that B. bassiana affected the mortality of M. persicae as an endophyte and an entomopathogen. Having an additive effect through endophytic interaction as well as infection is useful for increasing pest control efficacy in practical agriculture. Entomopathogenic fungi and other microbial control agents are generally perceived to be less effective than chemical pesticides and improved efficacy through multiple modes of action adds value to microbial control. In an earlier study, greenhouse strawberry plants that received soil application of M. brunneum withstood infestations of twospotted spider mite, Tetranychus urticae Koch, better than untreated plants (Dara and Dara 2015). Endophytic colonization of the fungus could not be determined by surface sterilizing and plating the plant tissue on selective medium, but treated plants performed better than control plants under mite pressure indicating a positive impact of M. brunneum on strawberry plants. In the current study, while the mortality of aphids was higher with the combined treatment of soil and foliar applications, surviving aphids did not follow the same trend showing slightly higher numbers wherever soil applications were made. In general, plants that received soil application of B. bassiana appeared to be healthier than untreated or foliar treatment alone and although not significantly different, plants that received the soil treatment had a slightly higher number of leaves during the observation period possibly contributing to higher surviving aphids. Other studies conducted in California also support this idea that entomopathogenic fungi, including B. bassiana, promote plant growth (Dara, 2013b, Dara et al. 2014). This is the first report of the impact of endophytic B. bassiana on the mortality of M. persicae on strawberry laying foundation for additional studies with major pests such as L. hesperus. Entomopathogenic fungi can play a significant role in integrated pest management and studies that elucidate their interaction with plants and pests will help promote their use in sustainable agriculture. Thanks to Jaclyn Wiley and Melody Carter for their technical assistance and David Headrick, Cal Poly for providing aphids and the greenhouse space for the study. Akello, J., Dubois, T., Coyne, D., Kyamanywa, S. 2008. Endophytic Beauveria bassiana in banan (Musa spp.) reduces banana weevil (Cosmopolites sordidus) fitness and damage. Crop Protection 27: 1437-1441. Behie, S. W., Jones, S. J., Bidochka, M. J. 2015. Plant tissue localization of the endophytic insect pathogenic fungi Metarhizium and Beauveria. Fungal Ecology 13: 112-114. Bing, L. A., Lewis, L. C. 1991. Suppression of Ostrinia nubilalis (Hubner) (Lepidoptera: Pyraliade) by entomopathogenic Beauveria bassiana(Balsamo) Vuillemin. Environ. Entomol. 20, 1207-1211. California Department of Pesticide Regulation (CDPR). 2014. Summary of pesticide use report data 2012: Indexed by commodity. Dara, S. K. 2013a. Strawberry IPM study 2013: managing insect pests with chemical, botanical, and microbial pesticides. http://ucanr.edu/blogs/blogcore/postdetail.cfm?postnum=19290. Dara, S. K. 2013b. Entomopathogenic fungus Beauveria bassiana promotes strawberry plant growth and health. http://ucanr.edu/blogs/blogcore/postdetail.cfm?postnum=11624. Dara, S. K. 2014. Strawberry IPM study 2014: managing insect pests with chemical, botanical, microbial, and other pesticides. http://ucanr.edu/blogs/blogcore/postdetail.cfm?postnum=19294. Dara, S. K. 2015. Strawberry IPM study 2015: managing insect pests with chemical, botanical, microbial, and mechanical control options. http://ucanr.edu/blogs/blogcore/postdetail.cfm?postnum=19641. Dara, S. K., Dara, S. R, Dara, S. S. 2013. Endophytic colonization and pest management potential of Beauveria bassiana in strawberries. J. Berry Res. 3: 203-211. Dara, S. K., Dara, S. S., Dara, S. S. 2014. Entomopathogenic fungi as plant growth enhancers. 47th Annual Meeting of the Society for Invertebrate Pathology and International Congress on Invertebrate Pathology and Microbial Control, August 3-7, Mainz, Germany pp. 103-104. Lewis, L. C., Berry, E. C., Obrycki, J. J., Bing, L. A. 1996. Aptness of insecticides (Bacillus thuringiensis and carbofuran) with endophytic Beauveria bassiana, in suppressing larval populations of the European corn borer. Agri. Eco. Environ. 57, 27-34. Posada, F., Aime, M. C., Peterson, S. W., Aehner, S. A., Vega, F. E. 2007. Inoculation of coffee plants with the fungal entomopathogen Beauveria bassiana(Ascomycota: Hypocreales). Mycol. Res. 111: 748-757. Tefera, T., Vidal, S. 2009. Effect of inoculation method and plant growth medium on endophytic colonization of sorghum by the entomopathogenic fungus Beauveria bassiana. BioCon. 54: 663-669. Vega, F. E., Posada, F., Aime, M. C., Pava-Ripoll, M., Infante, F., Rehner, S. A. 2008. Entomopathogenic fungal endophytes. Biol. Con. 46: 72-82. Wagner, B. L., Lewis, L. C. 2000. Colonization of corn, Zea mays, by the entomopathogenic fungus Beauveria bassiana. Appl. Environ. Microbiol. 2000: 3468-3473. Zalom, F. G., Bolda, M. P., Dara, S. K., Joseph, S. 2014. UC IPM Pest Management Guidelines: Strawberry. University of California Statewide Integrated Pest Management Program. Oakland: UC ANR Publication 3468. June, 2014.